WB No. 241: The Sound Interclub is a beautiful design, and is typical of many daysailers of 90 years ago, but they can require a lot of upkeep today. A modern take on this classic should be of modern wooden construction, have one-design class possibilities, be designed with the option of kit construction in mind (to be finished either by professionals or amateurs), but most of all be a delight to sail and watch sailing. Aurora’s glued-lapstrake-plywood construction lends itself to kit construction, and is accessible to the ambitious amateur builder. 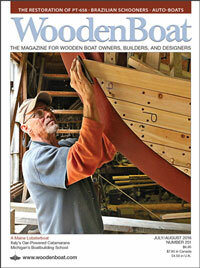 Sketchbook is a department introduced in the July/August issue of WoodenBoat (WB No. 239). The idea behind it is simple: Readers send us their requirements for a new and unique boat. 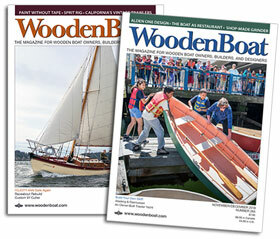 If their letter is chosen, our Sketchbook designers, Laurie McGowan and Michael Schacht, will develop the design and present it on the pages of WoodenBoat, and on this web site.